(2) as a postmodifier (a “reduced relative clause”) for pets — so ‘pets who were later found roasted, eaten in Denali Park’. Whoever bought pets at a Fairbanks pet store and then apparently roasted and consumed them just inside Denali National Park has not been identified. There’s some debate in the comments of our local paper regarding whether this headline is misleading. Chris speculates that different people have different favored parsing strategies — producing the debate over whether the headline is misleading. 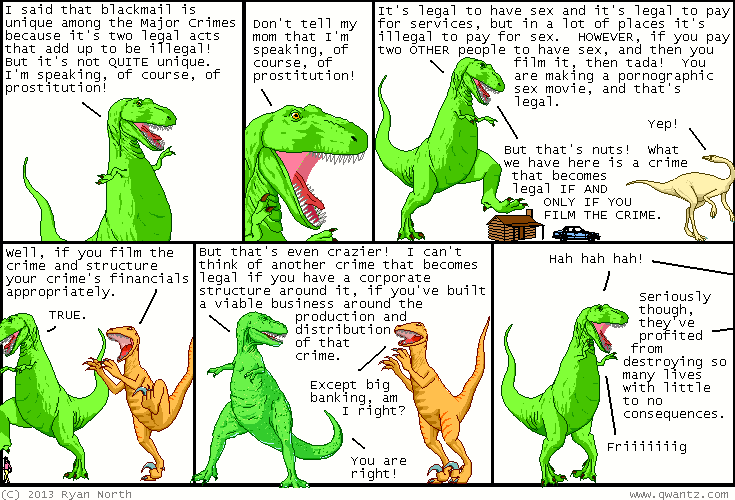 Blackmail, prostitution, pornographic movies, and big banking. Quite a set. The security systems intend the verifying reading — they provide a way to see if your kids are, in fact, safe(ly) at home — but of course they can’t ensure that this will be the case. Seen on Smallville this morning, an episode (centered on character Jimmy Olsen) that switched into film noir style for most of its time. This is a trope — duly noted on the TV Tropes site — that has appeared in episodes on other tv shows: Charmed, Moonlighting, Monk, Castle, plus some shows that drew on the style throughout (Peter Gunn, Angel, Veronica Mars). A borrowing of a characteristic visual style and thematic content from one (historical) medium into another, intended affectionately rather than mockingly. House (also known as House, M.D.) is an American television medical drama that originally ran on the Fox network for eight seasons, from November 16, 2004 to May 21, 2012. The show’s main character is Dr. Gregory House (Hugh Laurie), a drug-addicted, unconventional, misanthropic medical genius who leads a team of diagnosticians at the fictional Princeton–Plainsboro Teaching Hospital … in New Jersey. The show is formulaic, tying medical drama (with the team running through a series of diagnoses in the face of baffling symptoms) into the seriocomic soap-operatic drama of the characters’ lives. A commercial for Fiat of Burlingame that goes past me with some frequency ends with the name of the firm blared out emphatically — with strongly prenasalized [mb] in Burlingame. Prenasalized stops do occur sporadically for some American English speakers, most notably in monosyllabic renditions of ‘bye (goodbye), with [mb], and ‘kay (OK), with [ŋk]. I’d suggest voicemail deadlock or voicemail standoff. You are currently browsing the Arnold Zwicky's Blog blog archives for October, 2013.